If no priest is available, communion services are substituted. During inclement weather when Frederick county public schools are either late or canceled, there will be no Mass. EUCHARISTIC ADORATION: Every Monday 2:00 – 5:00 pm Our Lady of Mount Carmel Church. 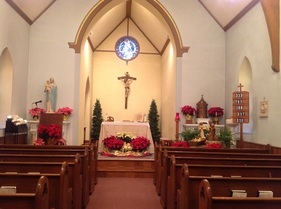 During inclement weather when Frederick County public schools are either late or canceled, there will not be adoration. Also when a Monday falls on a legal holiday, there will not be adoration. HOLY DAYS: Holy Day schedule as announced in weekly bulletin. CARE OF THE SICK: Please notify the Parish Office when a member of the parish is in the hospital or if someone is unable to attend Church and wishes to receive Holy Communion at home. SACRAMENT OF RECONCILIATION: Saturday afternoons 2:30 - 3:30 p.m.
First Saturday of the month at St. Anthony Shrine. ​​By appointment with Fr. Collin (301) 447-2367. 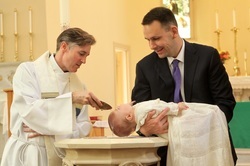 BAPTISM: Baptisms are scheduled through Deacon Joe Wolf, Director of Faith Formation 301-271-4099 or the parish office by calling 301-447-2367 or emailing saolmc@archbalt.org. A parish staff member will review the requirements as well as check the availability of dates. BAPTISMAL PREPARATION: Baptismal Preparation is held every other month. 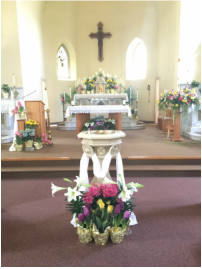 Details can be found in the parish bulletin. Expectant parents are asked to register for a baptismal preparation session with Deacon Joe Wolf, Director of Faith Formation 301-271-4099 or the Parish Office by calling 301-447-2367 or saolmc@archbalt.org.